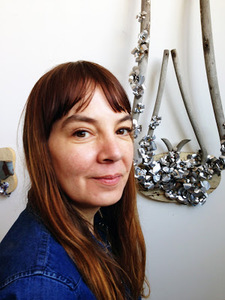 Anne Spurgeon is an interdisciplinary artist working in Brooklyn, New York and Columbus, Ohio. Questions about transformation reoccur in her creative practice. Her involvement began through performance, from playing guitar on stage, to creating private video performances about identity and the sense of the public and private self. In the past few years her focus has moved away from the personal consciousness of the body, to the transformation of sculptural materials. Wood, concrete, metal, and textile processes inform her studio work. Spurgeon has exhibited nationally and internationally, including work in exhibitions at ISE Cultural Foundation (New York, NY), Exit Art (New York, NY), Artist Space (New York, NY) and The Wexner Center for the Arts (Columbus, OH). She is a recipient of a collective artists grant from The Lower Manhattan Cultural Council, The Austrian Cultural Forum, and the Waskowmium. Her work has been reviewed in publications such as The New York Times, The New York Times blog, and Artnet News. She holds a BFA from The Ohio State University and a MFA from the School of Visual Arts. Spurgeon's teaching and administrative work includes The Museum of Modern Art (New York, NY), The Noguchi Museum (Long Island City, NY) and Grounds for Sculpture (Hamilton, NJ).